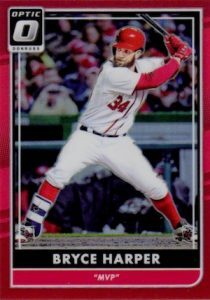 Essentially the Chrome version of the main Donruss set, it should not be all the surprising that the 2016 Donruss Optic Baseball Variations mimic the simple variations from the earlier release as well. 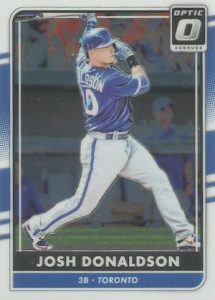 Five notable players are featured in the set with nameplate variations. 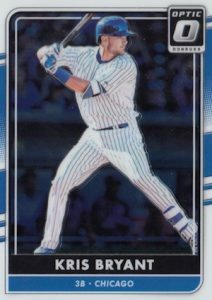 Shop for 2016 Donruss Optic Baseball Variations on eBay. 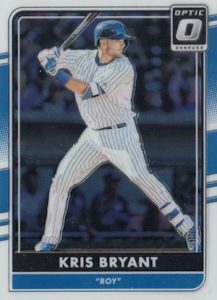 Like the main Donruss Baseball Variations, 2016 Donruss Optic Baseball sticks to the basics but on a smaller scale. 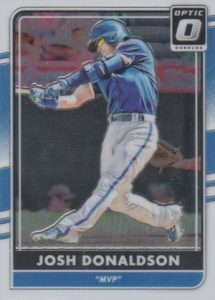 This includes younger talents such as Kris Bryant, Carlos Correa and Bryce Harper, as well as more seasoned players in Josh Donaldson and Jose Bautista. 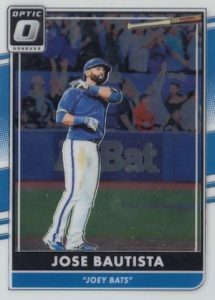 Everyone but Bautista is included in the 2016 Donruss Optic Baseball checklist with a notation for their Rookie of the Year (ROY) or Most Valuable Player (MVP) award from 2015. 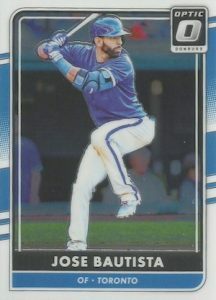 Meanwhile, Bautista's card showcases his "Joey Bats" nickname. 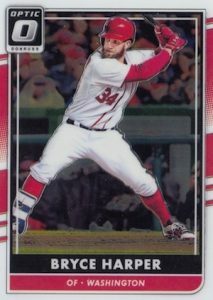 It is also the only card to change the player image, opting for his infamous bat toss. 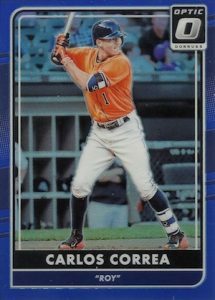 While the differences also include subtle cropping changes, the 2016 Donruss Optic Baseball Variations are easily spotted based on the text on the front. Each of the five players are shown below with both their base cards and the more limited short print. 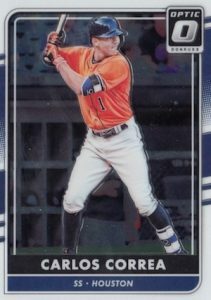 While the 2016 Donruss Optic Baseball Variations don't appear to be especially rare, they do have a lower amount of parallels than the base set. These include Blue (#/149), Red (#/99), Gold (#/10), Green (#/5), and Gold Vinyl (1/1) versions. Click on the listings to shop for cards on eBay. Parallels are shown occasionally but the image is the same. 2016 Panini Donruss Optic Baseball Hobby Box - Factory Sealed! 2016 PANINI DONRUSS OPTIC BASEBALL HOBBY BOX - 2 AUTOS! 20 RATED ROOKIES!